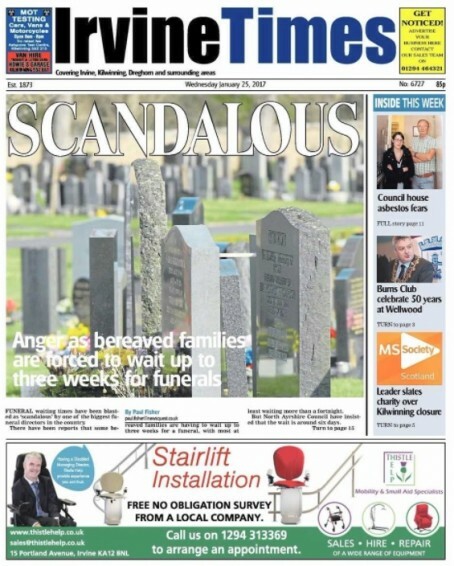 A council has acted after its “scandalous” delays on burials were exposed by two sister weeklies. The Irvine Times and Ardrossan Herald reported how grieving families were facing weeks of delays before burying their loved ones, with concerns that insufficient funeral provisions were being made by North Ayrshire Council. One funeral director branded the delays as “scandalous”, which has now prompted the authority to approve a Bereavement Charter, which means the timescale between registering a death and the burial taking place must be within five days in order to avoid unreasonable delays. The council cited “concerns raised in the local press” for setting up a working group to develop more effective working practices in the burials process. Reporter Paul Fisher, who covered the story, said: “Initially we were getting responses suggesting this was a temporary glitch, but we knew from the feedback we were getting that there was a real underlying problem here. Group editor Caroline Paterson added: “This was an important issue for our communities and it is good to see that, through highlighting the concerns of local people in our titles, something is now going to be done.